I am finally settled in my NEW apartment in Massachusetts with my HUGE kitchen. The hubs and I can both be in the kitchen at the same time! It has a dishwasher! I have a pantry I can walk in! The fridge is huge and has a water dispenser! Goodness gracious! At night I just walk in and look at everything and can’t quite believe it’s mine to play in (yes, playing). After a couple of safe go-to meals to test out the oven (my cast iron chicken and of course some great fish with healthy sides) I was finally ready to tackle something new. After a culinary weekend in DC with my amazing “cooking-is-just my-hobby-but-I’m-better-at-it-than-basically-everyone-ever” sister-in-law I was feeling delightfully inspired. 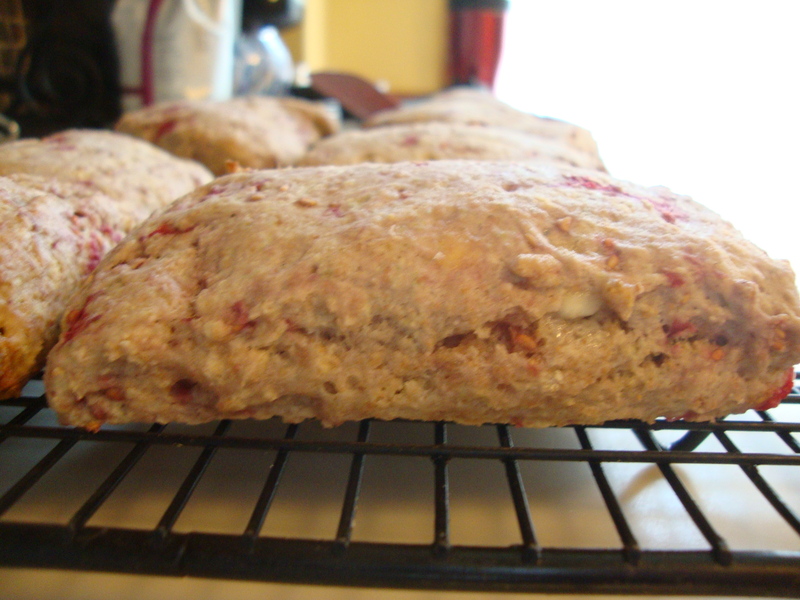 I spent an hour on the couch last night perusing through my Smitten Kitchen cookbook which was a gift from said sister-in-law when I happened upon Deb Perelman’s recipe for Whole-Wheat Raspberry Ricotta Scones. I’ve been wanting to try making scones for awhile and no where has a better scone than the Gazebo Inn in Ogonquit Maine. 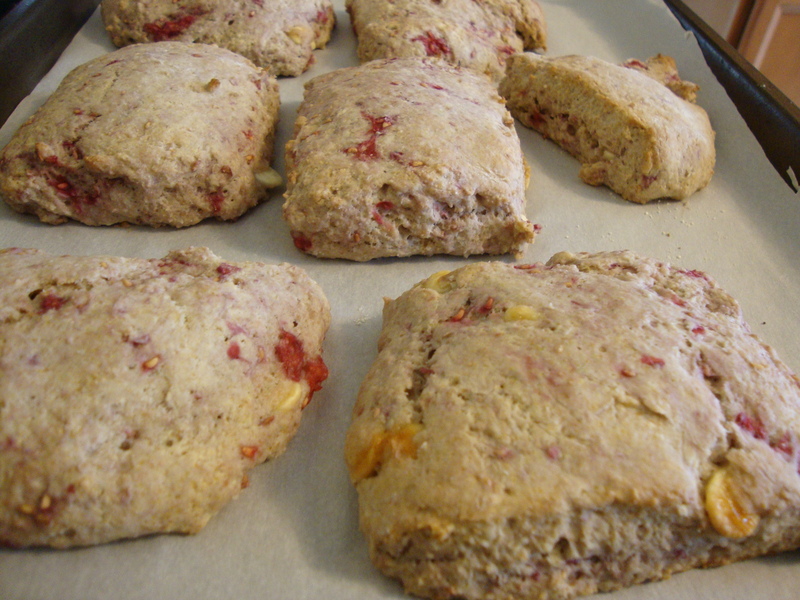 Besides the million other reasons you should stay there are the breakfast scones. It’s like a baby’s smile sprinkling into your soul. The photo in the cookbook looked very similar to what I’ve eaten in Maine so I decided to have a go at it. Below is Deb’s recipe with just a few simplifications. Part of her recipe calls for a pastry blender which I certainly don’t have (or know what it looks like…) so I took that part out of the recipe. I also was pretty nervous about whether I was following her recipe correctly so I have lots of pictures along the way. 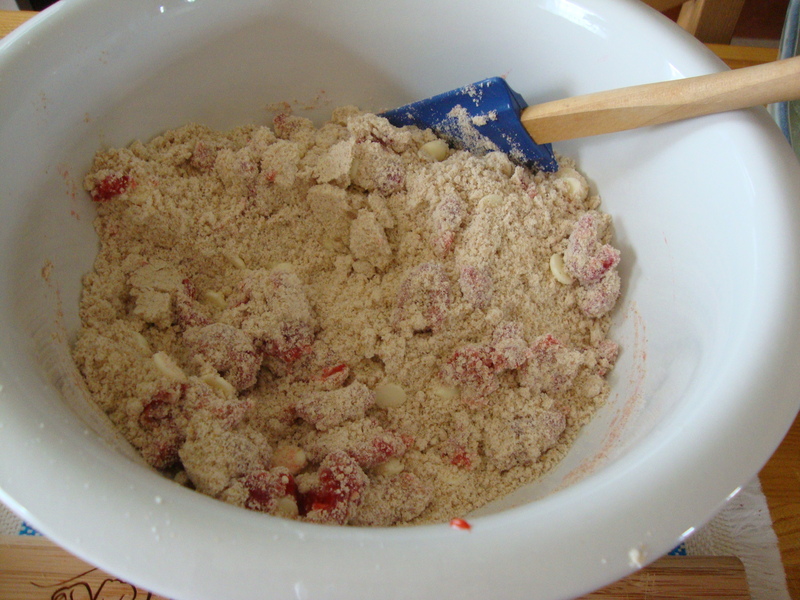 -1/2 – 1 cup of white chocolate chips (not in Deb’s recipe). I used a smaller amount but next time I might add a little more. 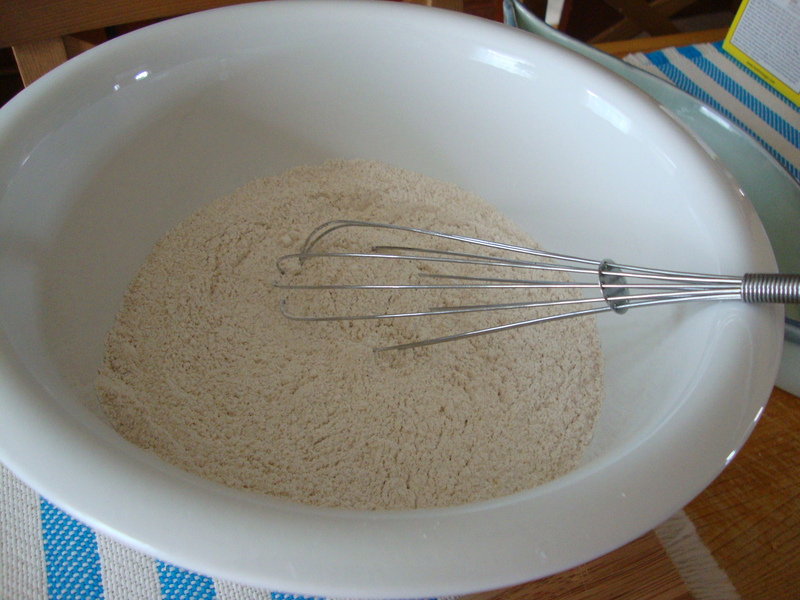 In a large bowl whisk the flours, baking powder, sugar and salt together. Place the butter on a small plate and cut it into small pieces with a knife. I took mine directly out of the fridge so you don’t need to have it at room temperature. Cutting it was a little tricky because my fingers were warm and it definitely got a little soft while I cut it. Then work the butter into the flour mixture with your fingers. Deb suggests mixing it until the mix “resembles coarse meal.” I definitely was working at it for probably 5 minutes. I did a lot of twisting and pinching… almost like I was opening a locked door with a key. Next rinse your raspberries and pat them dry (her instructions don’t call for this and I was worried the raspberries would be too wet – but I just dabbed mine with a paper towel and it was fine). Roughly chop them and add them to the butter-flour mix. Also add in the white chocolate chips. Add the ricotta and heavy cream to the mixture using a rubber spatula. 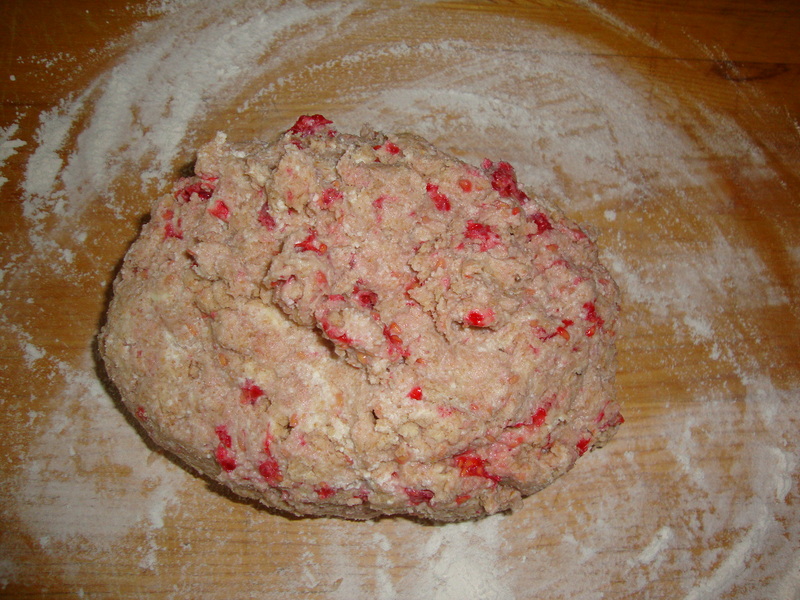 Mix together to form the dough. Flour a work space where you will be placing the dough (do this BEFORE you do the next step because your hands will be dirty). Now use your hands and knead the dough into a rough ball. Move the dough ball onto the floured work space and sprinkle flour on top. Pat the dough down until you have roughly a 7×7 inch square that is about 1 inch thick. 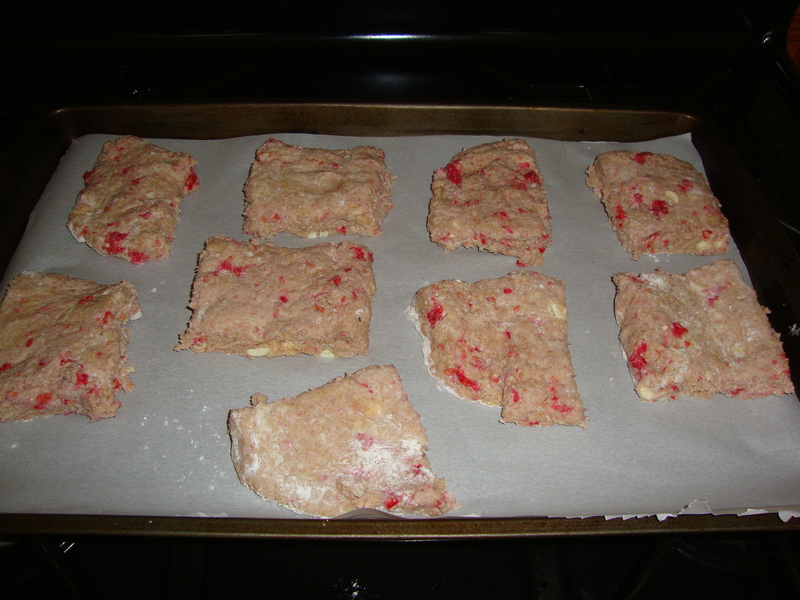 With a knife (or floss) cut the dough into 9 “squares.” Transfer the 9 squares to your parchment lined cookie sheet (they don’t need a lot of space). Bake in the oven for 15 minutes or until the edges get a little golden brown (mine was probably 16 minutes and it was perfect). Remove and let cool on the cookie sheet for a minute before transferring them with a spatula to a cooling rack. 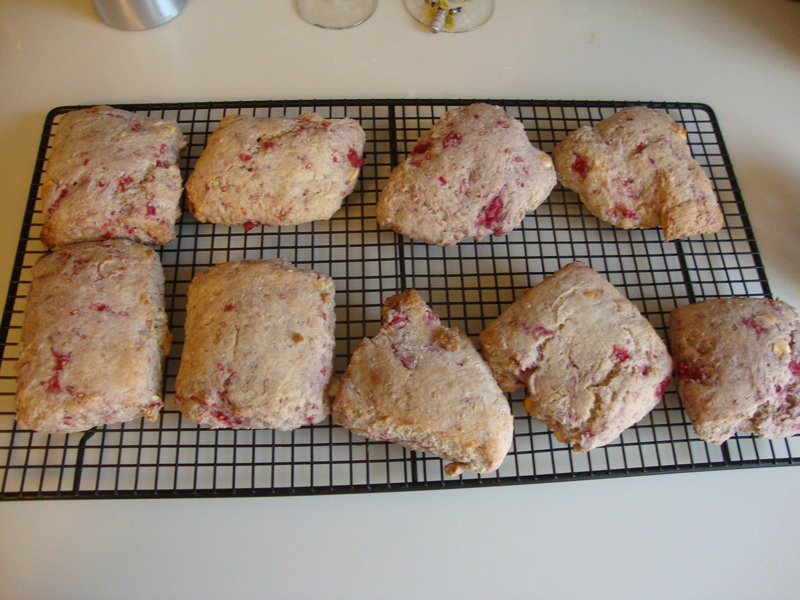 I let the scones sit for about 15 minutes before I ate one… (purely for scientific reasons). It was delicious. Enjoy at breakfast or even as a dessert.